Biology, ecology: Larvae growth approx. three years in rotten wood of deciduous trees. Larvae develop in trunks, branches and roots. Imago is common in deciduous and mixed forests from March until October. Imago is active during the day. This species can be a pest of wood used for technical purposes. Typical biotopes of this species in Latvia - Figs.3-4. Fig. 3. 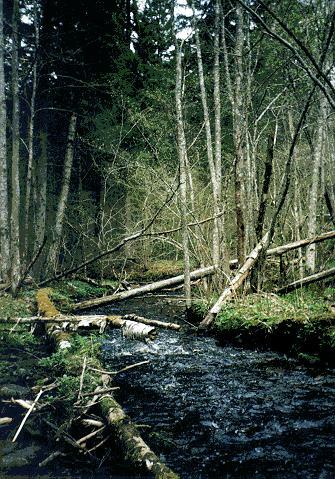 Moist mixed forests of the Kemeri National Park (Central Latvia) is the most typical biotope of Sinodendron cylindricum (Photo: Telnov, IV.1997). Fig. 4. 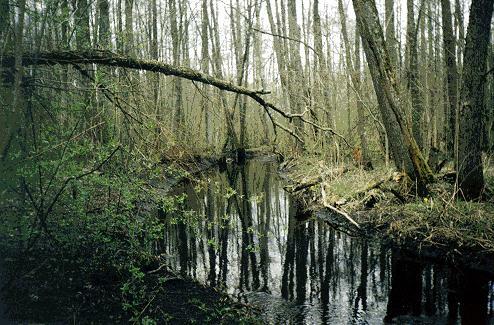 Mixed forest in the valley of Perlupe river near Ieriki (Central Latvia) (Photo: Telnov, IV.1996). Distribution in the region: Germany, Denmark, Poland, Latvia, Lithuania, Estonia, Belarus, Karelia Region (NW Russia), Finland, Sweden, Norway. Protection: Protected in Germany (3rd category - rare). Threat factors: Decline in decaying and hollow trees; destruction of old forest biotopes and old trees in parks. Biology, ecology: Larva growth normally five, max. eight years in rotten wood of oaks (Quercus spp. ), limes (Tilia spp. 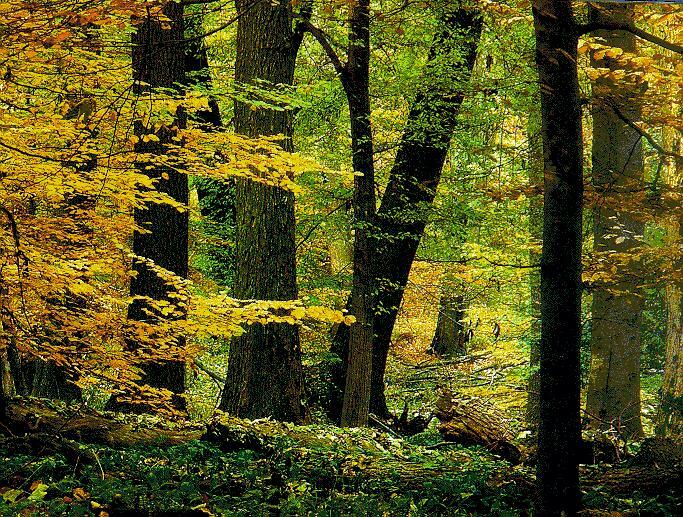 ), beeches (Fagus spp. ), willows (Salix spp. ), poplars (Populus spp. ), hazels (Corylus spp. ), ashes (Fraxinus spp. ), chestnut-trees (Castania spp. ), fruit-trees (for ex., cherry-tree), very rare in coniferous trees. Larvae develop in trunks and roots. Imago occurs in deciduous forests, parks and alleyesin early summer. Imago is active in the twilight and by night. This species is not a pest of wood used for technical purposes. Typical biotope of this species in Germany - Fig.5. Fig. 5. Lucanus cervus and Aesalus scarabaeoides occure in the old deciduos forests (Hainich National Park, Thuringia, Germany) (Photo: Telnov, VI.1995). Distribution in the region: Germany, Denmark, Poland, Latvia (northern border of distribution area), Lithuania, Estonia (northern border of distribution area), Belarus, Sweden. Protection: Protected in Germany (2nd category - vulnerable), Denmark (0 category - extinct), Poland (2nd category - vulnerable), Latvia (0 category - extinct), Lithuania (1st category - endangered), Estonia (0 category - extinct), Belarus (the 2nd category - vulnerable), Sweden (2nd category - vulnerable). Threat factors: Changes in the proportion of different tree species; decline in decaying and hollow trees; destruction of old forest biotopes. This variation differs from the typical form in that it is small in size and has small mandibles.